Be the first to share your favorite memory, photo or story of Carlie. This memorial page is dedicated for family, friends and future generations to celebrate the life of their loved one. 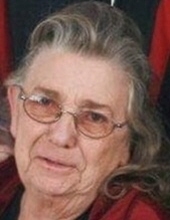 Carlie Jo Reed, age 73, of Hazard, KY passed away on April 09, 2019 at the Hazard Medical Center. Carlie was a member of the Church Lord Jesus Christ. She was born on February 09, 1946 to the late Wesley Fugate and the late Ethel Couch Fugate. She is also preceded in death by one son: Marshall Lynn Reed; one brother: Dexter Fugate and one sister: Edna Sue Hall. She is survived by her husband of 57 years: Marshall Reed; one daughter: Sondra (Tracy) Day of Hazard, KY; one sister: Bobbie Sams of Annville, KY; two brothers: Jimmy Fugate of Lexington, KY & Wesley Fugate Jr. of Manchester, KY; four grandchildren: Justin Marshall Day, Cherri Noble & Robert Reed & Kayla Miller; six great- grandchildren;special brothers-in-law: Gary Reed & James Reed; special friend: Sue Caudill and a host of family & friends. To send flowers or a remembrance gift to the family of Carlie Jo Reed, please visit our Tribute Store. "Email Address" would like to share the life celebration of Carlie Jo Reed. Click on the "link" to go to share a favorite memory or leave a condolence message for the family.